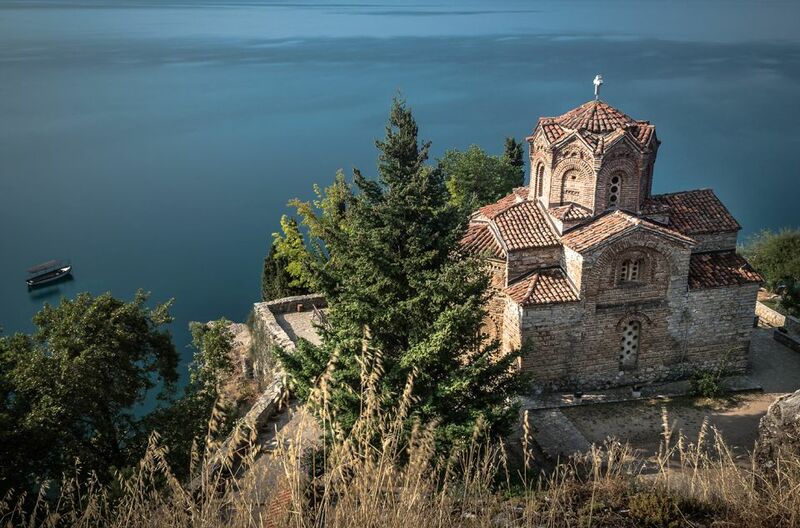 The Church of St. John at Kaneo overlooks beautiful Lake Ohrid. It was likely built in the 13th century and has undergone several renovations since then. The church is constructed of stone and wood, with the roof made of red ceramic tiles. Such tiles are typically made from materials such as terracotta or slate. The church exterior is adorned with ceramic sculptures and stone carvings. During renovations in the 20th century, frescoes were discovered in the dome of the church that have been exceptionally well-preserved. Such paintings were made by spreading a lime plaster and painting the surface while it was still wet.